It is written that at some point in the late 1840's an African-American congregation was formed in Westernport, Maryland. This was in the southwestern portion of Allegany County on the Potomac River. Known as the Brown Memorial Methodist Episcopal Church, in 1854 the group purchased a vacated Methodist church building on Front Street in Westernport to serve the congregation. Years later, in 1888, the congregation purchased a parcel of land across the Potomac River on Water Street in Piedmont, West Virginia. 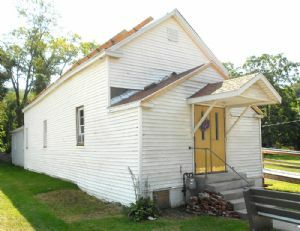 It was on this plot of land that had cost $150.00, that the congregation built a one-room wooden church building. Named Waldon, the church was affiliated with the Washington Conference that had been established in 1864 and comprised of African-American churches. The first pastor to serve Waldon was the Reverend Huskin. In 1968 the Methodist and Evangelical Brethren Churches merged to form the United Methodist Church, with Waldon then becoming a part of the West Virginia Conference. The Waldon United Methodist Church has been enlarged and renovated over the years with a kitchen, bathroom, porch, a sanctuary renovation in 2001 and the development of an adjacent park area. In 1980 Waldon become a charge of Piedmont's Trinity United Methodist Church. Pastors who have served Waldon through 2008 include the Reverends Melvin Washington, Johnson, Gordon, Ralph Monroe, C.E. Johnson and J.T. Tisdale, Les Clifford and Henderson Wheeler. Since becoming a charge in 1980, the Reverends have been Sumner Sawyers, Curtis Saville, Daniel Bryan, Meredith Ball, Joseph Jarrett, Elizabeth Allen-Villinger, and Bart Ray Thompson. As of this writing in August 2015, the pastor is Steve Grimes. It is interesting to note that a newspaper article appearing in the Baltimore Afro-American newspaper of August 21, 1924 refers to the Brown Memorial African Methodist Episcopal Church (A.M.E.) Church in Westernport. It was noted that the congregation was preparing to paint their church in early September, and that a Reverend M.B. Simpson apparently served the A.M.E. churches in Oakland, Westernport and Frostburg, all three being members of the Baltimore District Conference of A.M.E. Churches. Simpson is not identified as among the pastors who served Waldon in Piedmont. Without further research we can only speculate that as based upon what we have readily available, a portion of the Brown Memorial A.M.E. congregation may have in the 1880's split to form the Waldon church in Piedmont. Local history books also note that in 1885 there existed in Westernport a school for black children. The students numbered 19 in 1885, 20 in 1889 and 25 in 1895. These students met in the African Methodist Episcopal Church until the construction of a school in 1896. Local sources refer to it as "Waldon Methodist". Other credible references indicate "Walden Methodist" to be the correct spelling. We are deferring to the local sources in this particular instance. Historical information from Reflections: Remembering a Beloved Hometown - Celebrating the Sesquicentennial of the Town of Westernport, 1858-2008. Allegany County - A History, by Harry Stegmaier, David Dean, Gordon Kershaw and Jon Wiseman, 1976. According to Mineral County, West Virginia: Family Traits, Tracks and Trails compiled by the Mineral County Heritage Society in 1980, the Reverends R.L. Clifford (1947-1948), C.E. Johnson (1949-1950), J.T. Tisdale (1950-1959), R.E. Monroe (1959-1965) and Henderson Wheeler also served as ministers at the Janes United Methodist Church located in nearby Keyser, West Virginia. The church had been established as early as 1874.